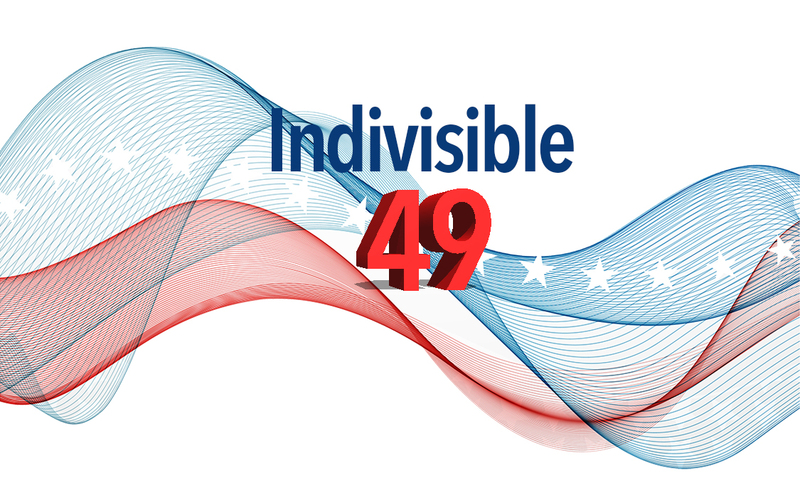 Get up to speed on the news and events in our 49th Congressional District. Thanks for keeping up the pressure with our largest rally yet at Darrell Issa's Vista office, where we showed that we will not be bowed by Issa or Trump's policies. Issa showed his true colors this week, claiming "Big Progress" in his newsletter to constituents, and by voting yes to let ISPs sell our browsing history. His real stance on the GOP healthcare bill was revealed by mistake in a series of ads, as reported here: ‘Awkward’: After health-care bill dies, ads air thanking Republicans for replacing Obamacare; the San Diego Union Tribune article puts Darrell Issa's ad first. Tuesday's Rally - Our largest to date with over 620 protesters. CNN covered the rally again, including an interview with our own Ellen Montanari. See the video here. More rally coverage: Indivisible Holds Issa’s Feet to the Fire. Thanks for the donations to the Vets. We needed 2 cars to hold them all! April 4 Rally - "We're here to stay, Darrell"
Our focus is on Russia this week at Issa's office. Be there at 10 am to show Issa that we expect him to represent us, not the telecom companies or Trump. This week is the anniversary of Martin Luther King Jr's death, so we will also demand civil rights for all, including immigrants. Bring your signs and bring a friend! Rally info. Call Issa regarding Russia: CD49 constituents, please call Issa (and both Senators) to demand transparent, thorough congressional investigations into Trump’s ties with Russia. Issa's taking another Healthcare survey: Constituent Survey. He reworded the options this time to include "Pass a European or Canadian style single-payer healthcare program." Another Resource for Weekly Actions: Whether you have 2 hours a week or 2 minutes, the "2 Hours a Week" website will give you ideas for action. Take a look! The EPA is under fire. Bills HR 1430 and HR 1431 just passed the House and are moving to the Senate. HR 861, Eliminating the EPA, might come to a vote soon. Bills under consideration in the House this week: HR 861 (designate N. Korea as state sponsor of terror), HR 1343 (raise the limit to $10 million for securities reporting), HR 1304 (tweak health insurance rules) and HR 1219 (again, the GOP helps rich people). The Senate is voting on the nomination of Gorsuch next week. Feinstein has not committed to voting against him. Click here for your weekly full legislative update. For the full House schedule, click here.